Eligibility: BE/ B.Tech./ B.Sc. Tech. Degree with at least 60% marks throughout academic career. Graduates graduating in 2011 can also aqpply. ME/ M.Tech./ M.Sc. Tech. Degree or 5 year integrated Master's degree holders with at least 60% marks throughout the academic career can also apply. Age : B.Tech. -25 years, M.Tech. - 28 years as on 01/01/2011. 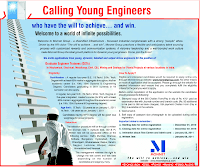 How to Apply : Apply Online at Monnet website http://www.monnetgroup.com from 01/12/2010 to 22/01/2010. Written Test will be take on 09/01/2011. 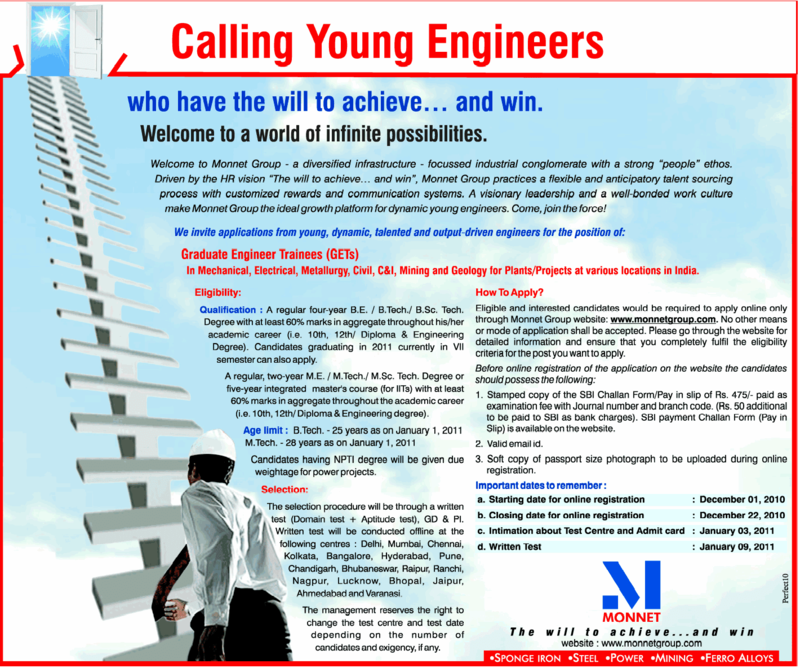 Click on the image to large view of the advertisement.